Denis Urubko has said in an interview with Desnivel that the climbers at Skardu are going to fly back to K2 base camp by helicopter. He expects that it will be a few days before they are back there because of worsening weather. As for rescuing Elisabeth Revol, he said that the helicopter dropped him and Adam off at C2 on Nanga Parbat. They climbed past C2 before seeing Revol. He said said that they aided her climb down because her frostbite would have meant it would have been harder for her to hold onto the ropes on the way down. They did make camp at C2 and provide water and medical aid for her. He said that the weather forecast was for worsening conditions on that mountain which made them have to make the hard decision not to rescue Tomek Mackiewicz. He said that he is expecting better climbing conditions on K2 at the start of February and is optimistic they can reach the top. Four of the climbers from the Polish winter expedition to K2 are now in Skardu after having rescued Elisabeth Revol on Nanga Parbat. After the weather has improved these climbers will join up with the expedition at K2 base camp. There has been no effect on the timetable to climb K2 at this stage. An incredible rescue has occurred on Nanga Parbat by some of the Polish climbers who were attempting K2. The Polish climbers were already acclimatized to altitude by reached 6300m on K2. They made a decision to try rescue two climbers they knew on nearby Nanga Parbat. A mountain as hard as any 8000m mountain and especially hard in winter. Four of the climbers from the Polish K2 winter expedition left K2 by Pakistani military helicopter and traveled the 130km to Nanga Parbat. These four climbers were: Denis Urubko, Adam Bielecki, Jaroslaw Botor and Piotr Tomala. Urubko and Bielecki started the climb towards the two striken climbers. Whereas Botor and Tomala established camp. Elisabeth Revol and Tomasz Mackiewicz had alerted their team that they were having problems at about 7400m. At this stage it is unknown if they had reached the summit of Nanga Parbat. Their ability to get down Nanga Parbat though must have deteriorated severely. Revol left Mackiewicz in a crevasse to shield him from the wind. He was suffering snow blindness. She went down the route to get help for him and to save he own life. It would have been a matter of survival for her in such a difficult situation on a winter ascent of Nanga Parbat. Urubko and Bielecki were dropped off by helicopter well below the last position of Revol and Mackiewicz. All communications were ceased from these two climbers. But as they were climbing towards the last known GPS point of Revolt, Urubko and Bielecki found her. Revol apparently has frostbitten toes but is in reasonable condition considering the ordeal she went through. At this stage the rescue of Tomasz Mackiewicz has been called off. He was last reported to be hiding in a crevasse from the wind. He was snow blind and suffering from frostbite. He would not have been able to easily to have gotten down. This has occurred because of the extreme height, general difficulties of the route and weather. It would have been a climb that would have put the Polish climbers at extreme risk. The four Polish climbers and Revol are expected to be evacuated to Skardu. Revol will need medical attention. If the rescue of Tomasz Mackiewicz has been called off then it would be expected that the four climbers who went to rescue them would return to K2. At least some or all of the Polish climbers attempting K2 are going to help rescue climbers. Climbers were attempting a winter ascent on Nanga Parbat and two of the climbers were in position for a summit attempt. But things started to go wrong. One of the climbers is snow blind. They are at about 7400m. They have tried to go down but are still at this height. The Polish Winter Expedition updated their page on Facebook with the following message. “Last night we received information from France. Elisabeth Revol and Tomasz Mackiewicz are stuck at about 7400 m under the peak of Nanga Parbat. After a night spent at this altitude, they tried to go down. Message from a moment ago, received from France: at the moment they are still at the height of approx. 7400 m waiting for help. A rescue operation coordinated by the embassies of France and Poland was organised. There is also Robert Szymczak, Doctor Alpine, Mountaineer. The base under K2 has been notified of the situation. A decision has been taken: 4 Climbers Expeditions (equipped with rescue equipment and oxygen) are awaiting information on the helicopter (flight capability) to move from the base under K2 to a rescue operation under Nanga Parbat. This rescue must put into doubt the whole of the expedition to climb K2 this winter. Four of the climbers of this expedition are going to join the rescue for those climbers on Nanga Parbat. 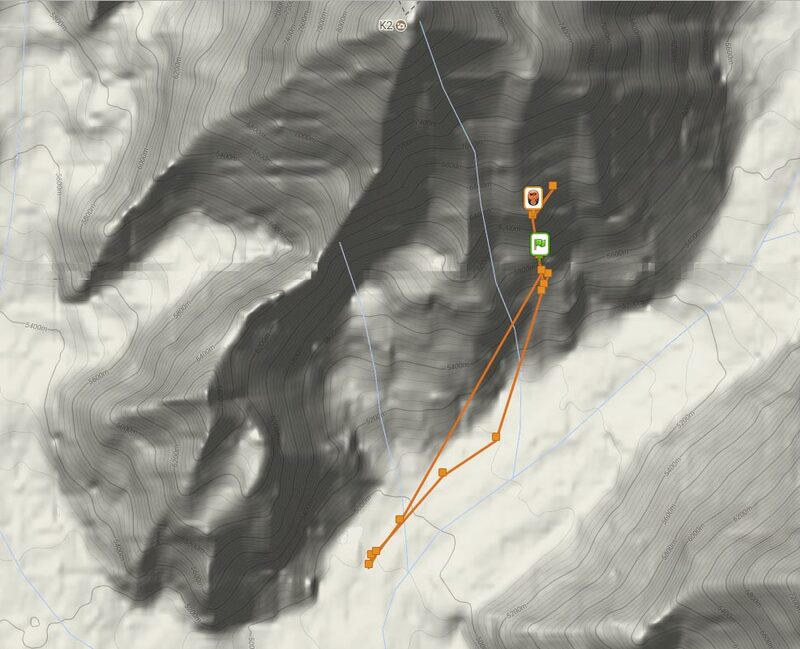 After going to C2 on the Cesen route up K2, Adam Bielecki has returned to base camp. There was a rotation of climbers to C2. This initial phase would have been to setup up the small C1 and the larger camp at C2. It would also have been used to acclimatize the climbers. 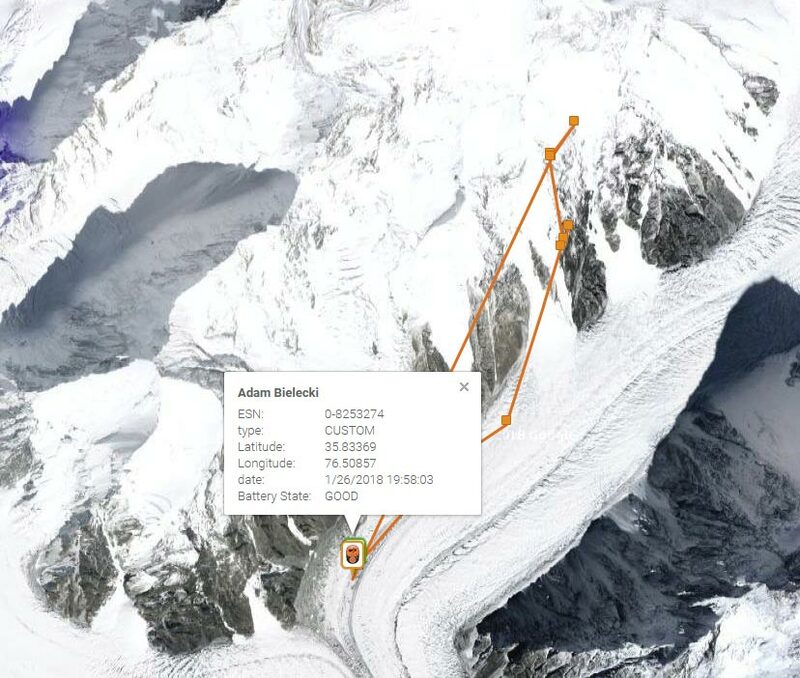 Adam Bielecki has a GPS which he has been using to update his position on K2. He has reached C2 but has not gone further. Here is a screen shot of his progress so far. The climbing up the Cesen has been marred by strong winds and difficult climbing conditions. There is is less snow than expected but there is more ice. Presently Adam Bielecki is at 6300m C2 and is awaiting 2 other climbers. These are Marcin Kaczkan and Maciek are expected to join him at C2. While 2 other climbers are at C1: Piotrek and Rafał Fronia. Some climbers have reached C2 on K2. There has been a small camp setup at C1, but this is not expected to be used as much as C2, which will be much larger. C2 is at about 6300m. C1 is at about 5900m. Denis Urubko setup this camp and there are 2 climbers in C1 sleeping over. The first camp for the Polish winter expedition will be skipped. Instead they are planning on establishing camp 2 at about 6200m. This will mean a longer day when they start climbing. But they have done this because it will mean that they can go further in preparation for higher heights. There has already been rope setup for when they reach camp 2, which will be their first camp up K2. The Cesen route was chosen because they thought that it would take less time to reach the shoulder of K2 at about 8000m, where they would likely establish their final camp. The Cesen is not necessarily easier than the Abruzzi Ridge route though. It is steeper, and the route less taken. But it does not have the avalanche danger of C3 on the Abruzzi Ridge, where there have been some huge avalanches in recent years. Nor does it have the technical areas of the pyramid and houses chimney that are on the Abruzzi Ridge. The Polish winter expedition to K2 has reached base camp. There are about 100 porters with them. They will construct base camp, wait for more supplies to arrive and then start making plans to climb K2. You are currently browsing the K2 Blog blog archives for January, 2018.